Love crab cakes? You can get one of the best crab cakes on the Eastern Shore at Fisherman’s Inn located about six miles east of the Bay Bridge along the Kent Narrows. As a lifelong Marylander and lover of all-things-crabby, I’m always searching for that perfect crab cake. Tons of restaurants and seafood stands tout themselves as having the best crab cake, especially here in Maryland where the crab is such an identifying element of our state’s cuisine. But I’m often disappointed. Don’t listen to the Food Network starts like Ina Garten or Guy Fieri who prepare crab cakes with green, yellow and red bell peppers, celery and onions. (Ina’s even has capers). Yuk! In Guy’s video he claims to be a crab cake aficionado just before he says “yum” as he watches filler ingredients whirling in a blender which are then poured over crab meat and squeezed by hand in a mixing bowl, shaped into a cake and smashed with a spatula on a hot, greasy griddle. On Ina’s TV show, Barefoot Contessa, she tells her audience that crab meat doesn’t have much taste so one needs to add ingredients to give it flavor. 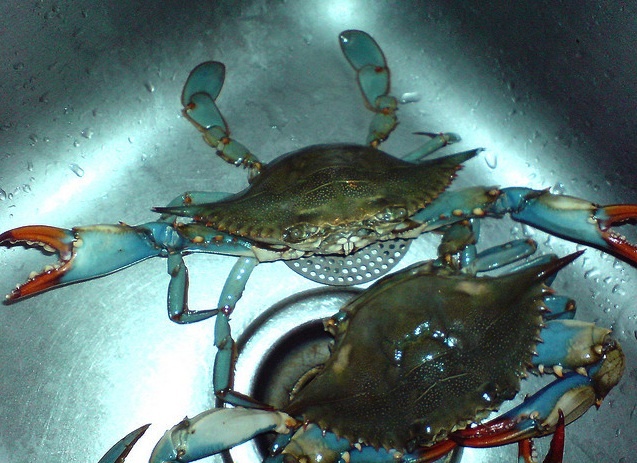 To somebody who grew up netting blue crabs off pier pilings in the Patuxent River and eating crab cakes prepared Southern Maryland style, this method of blending, beating and smashing the crab into a cake or claiming crab meat is tasteless is a desecration. There is something sacramental about ingesting the perfect crab cake. The meat comes that comes from of a Chesapeake Bay blue crab is anything but tasteless. It has a pungent flavor – clearly identifiable. But Maryland crab meat must be handpicked – every bit of it – making it expensive. Imported Asian crab meat is cheap – sometimes a 4-1 ratio in price, and restaurants will often use the Asian meat to drive down the cost. Some restaurants advertise that they use “Maryland Crab meat” but don’t mention that it’s been mixed down with Asian to increase the restauranteur’s profits. The effort to save money by adding fillers and stuffing the mix with foreign crab meat is what separates the fine crab cake from the ordinary – or worse. So Ina is correct with her “flavorless” reference when referring to the imported crab meat. But when you begin preparation with local crab meat, nothing should deter from the that musky flavor of the Chesapeake Bay crab. A good crab cake will have little filler and lots of local crab meat. The PERFECT crab cake is made strictly of backfin lump, and will have only enough filler to hold the cake together. 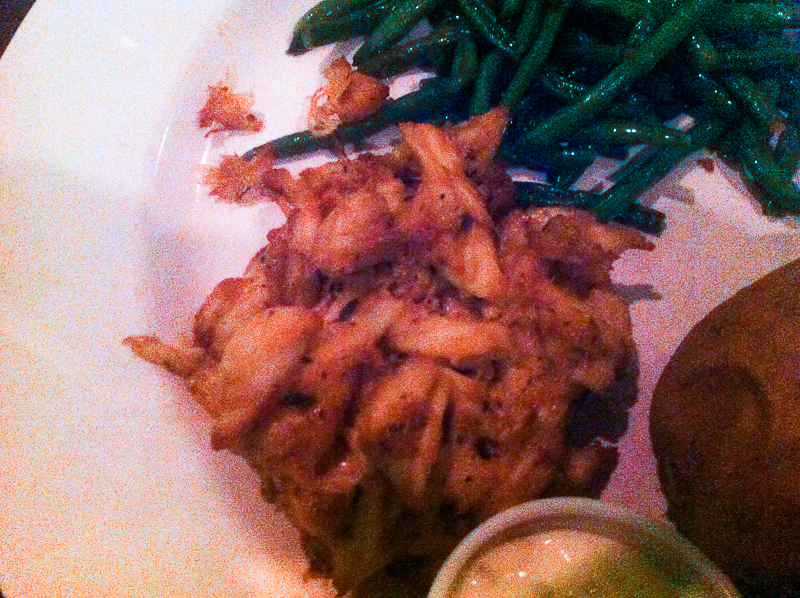 That’s the kind of crab cake I was served at Fisherman’s Inn when I ordered their Primo Lump Crab Cake. 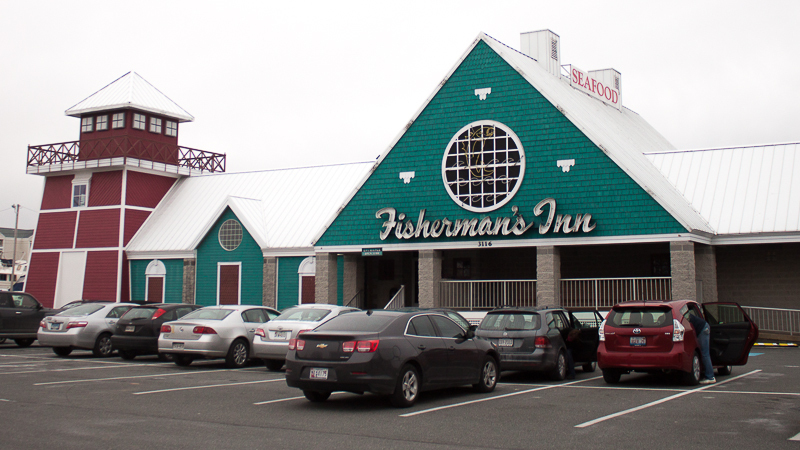 Fisherman’s Inn began operation back in the throws of the Great Depression in 1930. It was a filling station owned by the Schultz family with a little kitchen used to prepare food for travelers who stopped for gas on their way to shore. Today, it’s still owned by the Schultz family but has expanded to ten times the size. And the Shultz’s employ a staff who continue that legacy of a warm family welcome to both travelers and local friends. And their crab cake is worth driving a few hours for. The restaurant has plenty of additional crab dishes – 5 crab appetizers, 2 crab soups and 3 crab entrees, plus 14 different seafood dinners that include shrimp, oysters, scallops, salmon, flounder, live Maine lobsters and the catch of the day. Additionally there are beef and pasta dishes and many gluten free choices. Combine good food with a clean environment and hospitable staff, great water views and an adjacent seafood market, and Fisherman’s Inn becomes quite the destination. Oh …. and the desserts are amazing. No one wants to read a restaurant or food review that looks like marketing copy. So in examining the drawbacks…. the atmosphere is not intimate. It’s a big place with lots of people all in wide open spaces. This isn’t the place a couple would like go for an intimate quiet dinner. But that didn’t bother us. We don’t mind the crowds. Fisherman’s Inn also has a “touristy” feel. It’s a seafood restaurant on the Ocean Highway that leads to the Atlantic beaches. So lots of tourist go there. However, the owners have done their best (and I believe successfully) to give the restaurant a homey, welcoming feel. So what’s wrong with being a tourist? Lastly, I thought my appetizer, the Shellfish Steampot – littleneck clams, mussels and shrimp steamed in white wine garlic herb broth – was good, but it skimpy for $12.99. They food comes in a large steam pot with lid. Under the lid …..way down in the bottom of the pot were miniscule clams, mussels and shrimp. They get lost in that big pot. And there was fewer than I expected. I’d recommend they put them in a smaller pot and lower the price to $9.99 … and if they need to cut something out, they can hold the cheesy bread. Dan and I were coming back from our grandson’s birthday party on the Western Shore last December. We meant to stop in Annapolis for dinner, but forgot. So just after we crossed the bridge I began to think about restaurants and thought of Fisherman’s Inn. We hadn’t been there in decades. It was a Saturday night and the parking lot was packed – as was the restaurant. Keep in mind that December isn’t the tourist season. We decided to take a chance and jump in with the crowd. We weren’t sorry. We were immediately greeted by friendly people who welcomed us and show us to our seat. The service was quick and friendly. And besides enjoying a good meal, there’s so much to look at in this place! A model train track hangs from the ceiling in the great waterfront dining room and winds all the way into the back dining room. An lighted electric train with cars advertising local businesses quietly runs the track throughout the evening. Hundreds of pieces of Eastern Shore memorabilia decorate the walls – including oyster tins, old advertising signs and antique waterman tools. 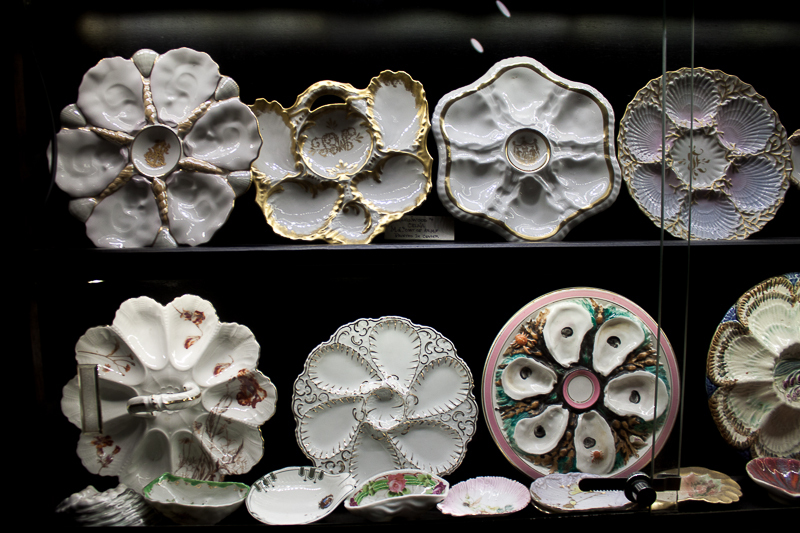 The most impressive eye candy is Ms. Betty Schultz’s collection of over 400 oyster plates. They are encased in every room. What’s more impressive is that these plates comprise her second collection. Her first collection was lost in a fire that destroyed the restaurant in 1980. 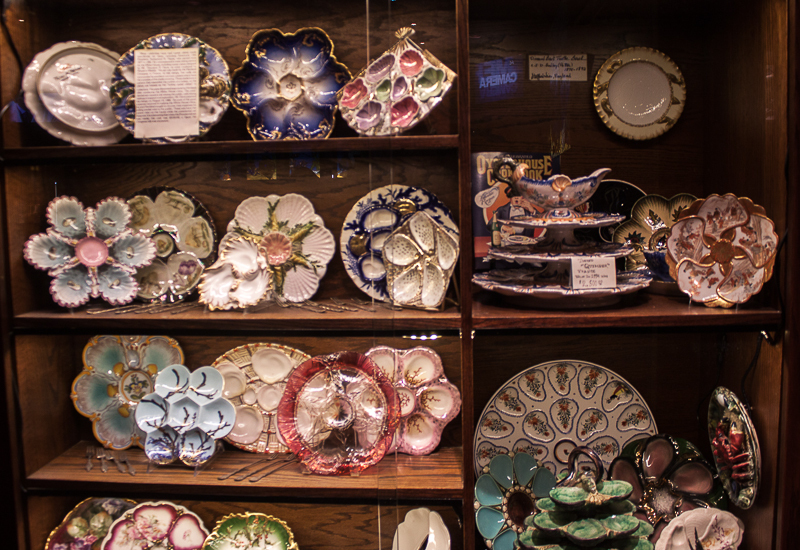 The oyster plate collection at Fisherman’s Inn is the largest collection of oyster plates in the region. The Primo Lump crab cake at Fisherman’s Inn has big lumps of backfin crab meat barely held together by a scant amount of filler. While there was a slight taste of mustard, Old Bay and salt, the pungent flavor the Chesapeake blue crab was prominent. My crab cake came with two sides – baked potato and roasted asparagus. My meal was priced at $23.99, and for back fin lump, that’s a good price. I savored the taste of that crab cake. I’d rank it #2 on the Shore… for what’s that’s worth. What’s #1? Old Salty’s on Hoopers Island in Dorchester County. Same qualities – back fin lump only, almost no filler, just the right touch of mustard and seasonings and bigger than the one served at Fisherman’s Inn. Old Salty’s set a high standard for crab cakes. One MUST try both. I’d love to try the two of them side-by-side…. maybe blindfolded. Another perk of going to Fisherman’s Inn is that the recipes for many of the dishes served in the restaurant are in Ms. Betty Schultz’ Fisherman’s Inn Cookbook, available for sale at the restaurant. The book chronicles the history of Fisherman’s Inn and the Schultz family, and it’s full of old photographs of the area showing the changes over the years. The subtitle, A Collection of Recipes and Memories gatherd for over 70 years in the restaurant business on Maryland’s Beautiful Eastern Shore sums up the contents. It’s 350 pages of regional recipes and lore. It can be purchased for $20.00 in the restaurant or through the Fisherman’s Inn website. I leave you with one of Ms. Betty’s crab cake recipes (from the Fisherman’s Inn Cookbook). Combine all ingredients except crabmeat and cracker crumbs. Blend well. Add crabmeat and toss to coat meat evenly. Add cracker crumbs and re-toss being careful not to break up any lumps. Form into patties and cook in skillet or bake in oven until done. **Tip from Ms. Betty: Always handle the crab as little as possible, and as gently as you can. **Tip 2 from Ms. Betty: Start with absolutely fresh crab, preferably jumbo lump… Place crab cakes on a baking sheet, and chill for at least 1 hour before sauteing or deep frying. I wonder if we have eaten there. It sounds familiar. I’ll ask my husband — and if not, we will try it if we are in that area. Dona, Fisherman’s Inn is just under the Kent Narrows bridge. It’s pretty popular and easily seen from the bridge. You should definitely give it a try the next time you come to the Shore. Their food is delicious.